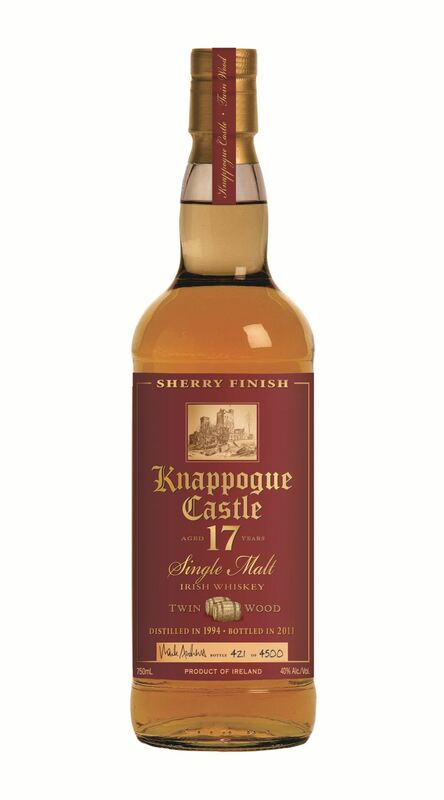 There was a Knappogue Castle Twin Wood 16yo released about this time last year. To recap, that 16 years was a combination of 15 years and 3 months in bourbon casks, followed by 9 months in sherry casks. They clearly didn't bottle all of it last year because now we have a 17yo Twin Wood with an extra 12 months in sherry. The color is medium deep reddish gold. The aromas conveyed are rich, malty, fruity, nutty, spicy; there is a mellow woodiness, slightly peppery; good age complexity; overall the aroma is quite intense. The taste is powerful and complex, with a lovely balance of deep-aged malty oils and fruity sherry maltiness; notes of dusty dark chocolate and woody vanilla notes, a slight peppery background, and some sweetness add to the layers of complexity. The finish gives a nice sherried, fruity maltiness, layered with some lingering sweetness and dark chocolate. There were only 1,900 bottles last year so the 4,500 bottles this year looks very positive indeed. The press release describes the 16yo as a "runaway success" with both the trade and consumers. Perhaps they also think the "extra richness and complexity" of the 17yo warrants a larger release. It will certainly taste different. Quite sherried already at 16 years old, this one must pack a fair wallop. Some people love that, and it's rare enough in an Irish whiskey. One to seek out for a taste in 2012, I'd say.